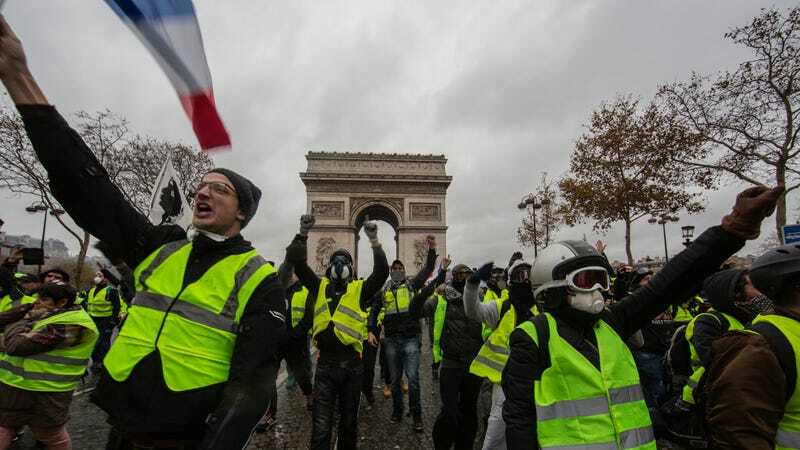 More than 280,000 protesters donned yellow safety vests that motorists are required to keep in their cars and took to the streets across France last weekend. The protests have arisen organically through Facebook and other social media platforms, and span the ideological divide. Their focus has largely been on the unfairness of Macron’s proposed gas tax, which would’ve raised prices by €0.029 per liter ($0.12 a gallon) on unleaded gas and €0.065 per liter ($0.24 a gallon) on diesel. Rising oil prices have pushed fuel prices higher still now was among the worst times to propose such a tax. The French government has spent years promoting diesel, and the tax would’ve left many already struggling to make ends meet with higher fuel bills on vehicles they’ve been encouraged to buy. The money it raised would also have been used to combat the national deficit, which has been made worse in part by the Macron government’s policies, like lifting portions of a wealth tax. In short, the gas tax was a technocratic fix without any real constituency and the benefits were poorly explained, leaving it open to criticism and protest. The yellow vests enjoy a broad base of support with a recent poll showing that 72 percent of the French public is sympathetic to the cause. Spain recently offered a buyout for coal miners as it plans to shut down the industry by the end of the year. A just transition is also a central tenet of the Green New Deal proposed by Congresswoman-elect Alexandria Ocasio-Cortez. And it’s a theme of this year’s climate talks in Poland. Reitzenstein, who is at the talks, said that the French protests have been a “hot topic” among the conference halls and meeting rooms as delegates grapple with the need to address climate change in the most equitable way possible. That illustrates some of the key principles Gerasimchuk said are part of just climate policies, including clearly communicating the benefits, engaging with communities, and building broad support. Macron could look at that as one avenue to build a new gas tax, but ultimately his government really needs to listen to the people in the streets. And those voices are speaking more loudly about the broader structural issues in France, many of which are found throughout the developed world associated with neoliberal policies that have driven inequality to some of the highest levels in modern history. The rising inequality also means the richest 10 percent of the world emit 50 percent of its carbon pollution, shining a potential glaring spotlight on who should pay the most to address climate change.